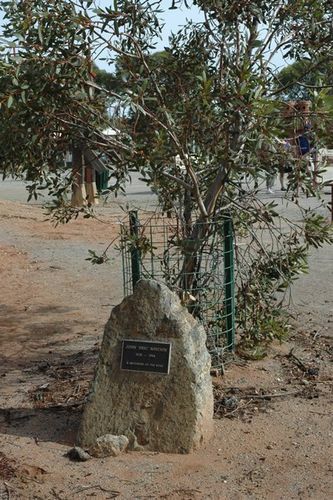 Plaque commemorates John `Eric` Minchin who was one of the "Brushmen of the Bush". Between 1973 and 1989, the five mates from Broken Hill - Hart, Absalom, Pickup, Minchin and Hugh Schulz - toured the world, staging more than 50 exhibitions and raising $1 million for charity in today`s terms. The unusual partnership began in 1973 when Minchin was invited to stage a fund-raising exhibition in Chatswood for a children`s charity. Minchin asked three fellow "unknowns" from Broken Hill - Absalom, Pickup and Schulz - to provide some paintings for the show. At that stage no one asked Hart. Pro Hart was already a popular artist and the group didn`t want to be seen as capitalising on his success. Pro heard about it and asked to join. The turning point was an article in The Australian Women`s Weekly. A subeditor picked up on Pickup`s throw-away line, headlining the feature "The Brushmen from the Bush". A marketing legend was born which took them everywhere from Orange, Albury and Toowoomba to London, New York and Rome. The partnership only ended in 1989 when Minchin died and Schulz`s eyesight failed.